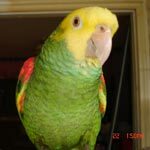 Parrot Forum • View topic - Why are small parrots under appreciated? Why are small parrots under appreciated? 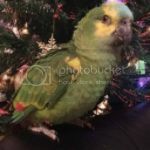 Re: Why are small parrots under appreciated? I would love to free fly my birds someday, but for now I think it's just too risky. With the birds I currently have I won't be freeflying them, just because they are so small and could get lost so easily. They also never go outside so they would probably get spooked by a noise and off they go. I personally wouldn't enjoy having an aviary, just because birds that live in an aviary are usually not tame. I HATE it when people buy budgies and lovebirds and just treat them like decorations who sit in a cage and tweet a pretty song, if you want a bird like that just get a canary. Parrots are a lot of work, no matter the size, and people really should start treating small ones like their bigger cousins. Yes, they need love and respect also. They need proper lighting and healthy food. I can get in a really long conversation at the bird food area of a store. Most people do not know what they are capable of. I tell people what special little beings they are. I tell them the personalities of some of mine to start them looking for the personality of theirs. If I had an old dress that I didn't really like and others started telling me a beautiful it was then I would look at it in a different way. I try to get them interested in looking at their birds in a different way. Trick or 'Tiel wrote: I would love to free fly my birds someday, but for now I think it's just too risky. With the birds I currently have I won't be freeflying them, just because they are so small and could get lost so easily. They also never go outside so they would probably get spooked by a noise and off they go. I personally wouldn't enjoy having an aviary, just because birds that live in an aviary are usually not tame. I HATE it when people buy budgies and lovebirds and just treat them like decorations who sit in a cage and tweet a pretty song, if you want a bird like that just get a canary. Parrots are a lot of work, no matter the size, and people really should start treating small ones like their bigger cousins. Actually every single one of the birds he owns are tame and most people that do free fly let them live outside in a Aviary, Lots of smaller birds are free flown too of course its a lot of work you cant just up and say I'm gonna free fly, Theres a lot of steps involved including getting all the knowledge you need, Lots of people do free fly single Cockatiels but he says its best to fly them in large Flocks of at least 10 though he only flies 2 Macaws and a Major Mitchells Cockatoo and he has friends that join him with all their birds. No, I don't breed them. I am completely against breeder parrots to be used as human pets but I do allow them to go through all the motions, just as nature decreed they should (they are happier than way, it completes their life like nothing else can). I also don't believe in free-flying birds. I think it's way too risky for them and even the professionals have ended up losing some (which means certain death for them, most likely). The little ones do well until they become of an age when they become sexually active - then they become unpredictable and might fly away. We have a member who used to fly his GCCs but no longer does although he still free-flies his grays. But I don't see putting a number of little ones in a large flight cage or an aviary as a bad thing. As long as they are kept right (good food, good light and good light schedule, medical attention, etc), they are actually EXTREMELY happy living like that and not everybody needs a bird to be a personal companion to enjoy it (read Liz's postings about her tiels and you'll see). I love them the same whether they are tame or not... and, when it comes to the little ones, they can live in a flock and still be tame and interact with you so it's always a net gain for them because they get the best of both worlds. He's been free flying them years and never lost one, Not saying it isn't possible but if it did happen it would be easier to retrieve them and after all they are overly healthier than indoor birds, Id do it myself but definitely wouldn't have the time now and the skills are better if you start with a fledgling.Free flying is not just recall training like those GCCS and Greys its a lot more complicated. I just wouldn't get a pet if I couldn't interact with it... but that's just me. I think that finches are good if you want a bird simply to watch and enjoy their song. I'm not saying that they aren't happy in an aviary if they are untame, I just said that I would prefer an interactive companion. I said that keeping an untame bird in a cage is bad, because they just sit around alone with nothing to do and never get to fly. For me, I just wouldn't keep birds if I couldn't take them out and play with them. I think keeping untame parrots and finches in an aviary is kind of like having a fish tank, all you do is watch them and you can never get any love and affection from them. Free flying scares me. There are so many preditors waiting to get them. Even big birds are not safe. I watched a video where a man had his Cockatoo on his shoulder when a hawk came down and tried to take it. He had to physically fight the hawk off. Then the hawk came back and tried a second time. I am sure his Cockatoo developed PTSD. I had a chicken from one day old. All she had to interact with was dogs. They accepted her and she must have thought she was a dog. She went out to play when they did and came in when they did. One day it was raining and my "sissy" dogs did not got out until late afternoon. They came in without Chick Chick. The next morning the dogs found her and was bringing her in with them. It was truly awful what she had gone through. She was so big that a hawk could not pick her up. Instead the hawk ripped her back off from head to tail with only muscle left showing. Feathers, skin and fat where all gone from wing to wing. She had been in so much pain that she could not move to come in the night before. It was awful and I cried for her while tending the wound. I would not let any bird smaller than an emu outside without a cage. liz wrote: Free flying scares me. There are so many preditors waiting to get them. Even big birds are not safe. Theres a huge difference with a bird on the shoulder and say a Macaw in the air flying lol, They look like aliens to predators so if your flying in a different location all the time the predators most likely wont wanna come near this strange alien screaming and when they do encounter predators they get away.More and more people are starting to free fly and less clipping is happening which is great.These are skilled flyers we are talking about much different than letting your birds outside who would be very bad flyers and would be easily attacked. Yes but when mistakes happen its not the human that has to endure being eaten alive for 2 hours. If the human's life depended on it rather than the birds would the human still risk freeflying? I Doubt it. stevesjk wrote: Yes but when mistakes happen its not the human that has to endure being eaten alive for 2 hours. Well they sure don't do it for themselves, Once you start free flying you cant just stop and at least they live a good life better than our Parrots lol and either way would you say the same for a wild parrot being targeted by predators? Well its exactly the same these free flyers have the same skills and can avoid predators only the free flyers have the advantage.